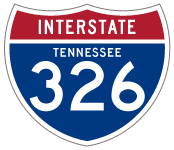 I-326 possible number for US 321 (SR 67) Existing freeway between Johnson City and Elizabethton, TN. The freeway section of U.S. 321 (Milligan Highway) leads east from a parclo interchange with Interstate 26 in Johnson City to Tennessee State Route 359 (Milligan Highway) in western reaches of Elizabethton. Upgrades were never made to this stretch of highway and no further efforts promoted Interstate status.